Selecting a video streaming solution is not as daunting a task as one might think. Hundreds of church organizations and online ministries use video streaming to share their message across the world. 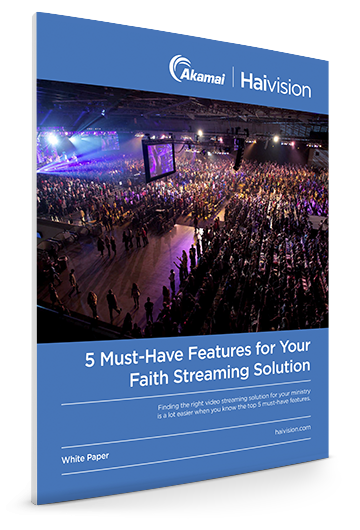 This white paper outlines five core components to help you find the right faith streaming solution for your ministry. As you evaluate technologies and services, look at your challenges and requirements holistically – it's about a long-term solution that can grow, adapt, and scale with your ministry. While there are multiple providers who offer a wide selection of features, not all solutions have the fundamental capabilities that are right for your ministry. That's why it's very important to separate the must-haves from the nice-to-haves. To help you with your search for the right solution, we've outlined the following five core components that every faith streaming solution should deliver.